SS Solutions is the distributor of SAP in Bangladesh as well as the only SAP Education Partner. SS Solutions has wanted to address the scarcity of SAP professionals in Bangladesh for long. With that goal in mind SS Solutions has partnered up with AIUB to increase SAP professionals. In the process AIUB has become the first and only university in Bangladesh to integrate SAP curriculum into its courses on enterprise resource planning. AIUB will also offer professional SAP courses from 15th February. SS Solutions will provide the curriculum and experts to conduct the training while AIUB will provide the logistics. 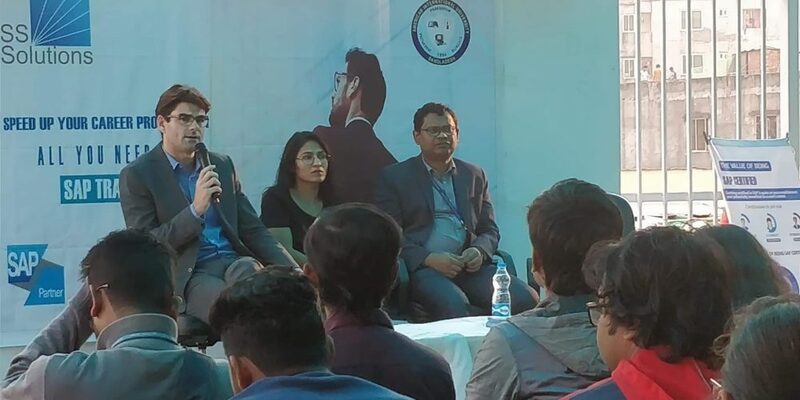 SS Solutions operations director Alexander Bratzler and Mashiour Rahman, director of AIUB’s Faculty of Science and Information Technology fielded questions regarding their new initiative and how it could contribute towards building a richer human resource base. Alex Bratzler was trained in information administration management at the University of Karlsruhe in Germany. He also has an MBA from the University of Oregon in USA. Alex has invaluable experience of 10 years working in different roles at SAP SE that included Business Analyst, Solution Management for Public Services and Sales &Marketing. 1. What are the different market trends your company sees in the job market? Globally, I see the service sector growing strongly, while the other sectors are either shrinking or stagnating. In India, for example, 60% new jobs are from service. By 2020, 12 crore jobs out of a total 20 crore will be in the service sector. Here in Bangladesh with the Digital Bangladesh initiative the trend is not much different. New jobs are being created mainly in the service sector. 2. What are the challenges your company faces with this trend? Although jobs are available, there is a gap between required skills and knowledge, and what the candidates are offering. This is speaking from a purely competence perspective. Thus, readily fit candidates for these new job openings are not available. Companies need to train new recruits to fit into the new jobs. It is ultimately a burden to businesses and incurs extra cost. So the problem is not the lack of jobs or unemployment. It is the ‘Un-Employability’ of candidates. It is the lack of the required skill set that is at the crux of the matter. This competency gap is being measured in a marking schema. We speak of a person’s employability index. 3. Is an academic degree enough to meet these challenges? Getting a degree with high grades from a highly reputed university like AIUB is the entry ticket into the job market and the prerequisite to apply for any job. But how do you differentiate yourself from your competition. What are the ways to make yourself more interesting to future employers to boost your employability index? Here candidates need to find ways to align their CV with a company’s factors for success. Mashiour Rahman has an MSc from the National University of Singapore and has an ongoing PhD at Utara University of Malaysia. Mashiour Rahman has been with the dapartment of computer science at AIUB since 2000. This associate professor of computer science has worked as the coordinator and head of the computer science department and is currently working as director of the faculty of Science and Information Technology. 1. What is the current scenario of IT/business job market in Bangladesh? At present, IT/business job market in Bangladesh demands something extra. There are a lot of jobs but the right resource or right candidate for the jobs is scarce. The trend of the job market is rapidly changing not just in Bangladesh but also worldwide. Students need to adapt to technologies like SAP if they want to stand out. 2. Why is AIUB partnering with SS Solutions regarding SAP Training? What do they hope to gain for the students? 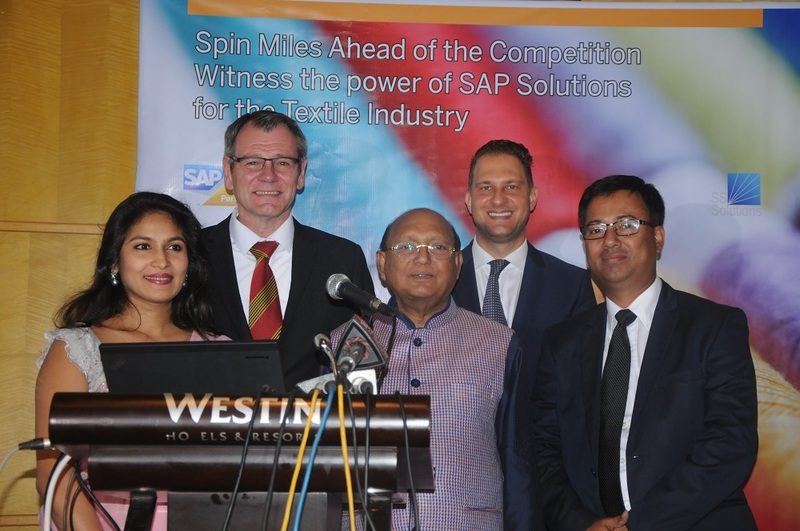 SS Solutions is the only SAP Education Partner in Bangladesh now. Apart from that, they are connected with all the current SAP customers as well as the potential SAP customers. They experience the scarcity of the resources in their own organization, their partners and customers as well as in companies that are potential future SAP clients. Students of AIUB can use this as a glorious opportunity as it is currently the only university offering professional SAP courses. Students of AIUB can get the benefits of being able to cater to this huge demand since they can become the only supply of SAP certified human resource at the university level. 3. What will be the difference between graduates of other universities and AIUB graduates who are gaining knowledge on SAP? AIUB students will stand out among the IT crowd and be something different. SS Solutions and AIUB has come together to incorporate SAP course materials in academic as well as professional courses. Students will get the basic first hand idea regarding SAP in their academic curriculum of ERP course and they will have a full fledged opportunity to be professionally trained in SAP which only AIUB is providing at the moment. 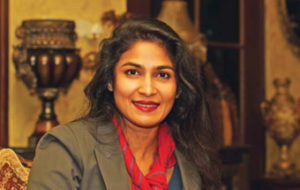 Sarazeen Kazi is undoubtedly smart, but she does not have any of the neurotic self-consciousness or self-doubt that usually accompanies exceptional intelligence. Her faith in what she does is total. 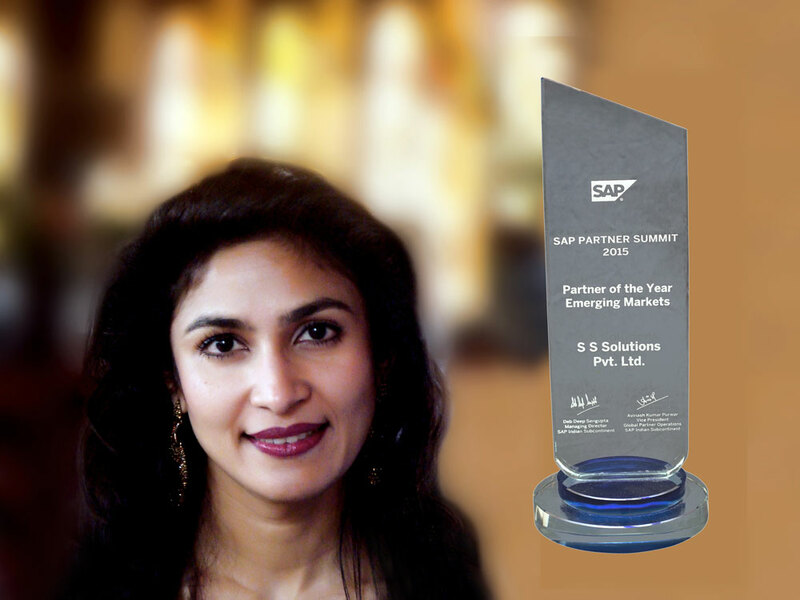 She is the co-founder and managing director of SS Solutions, a SAP gold partner in Bangladesh. In just about three years, it has become a quintessential icon of youthful success having more than 50 top Bangladeshi companies as clients. “We help companies run better by increasing profit and lowering costs,” she confidently says. 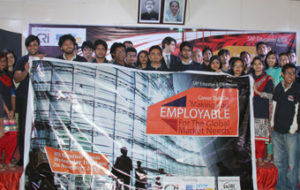 SAP Education and CRI (Centre for Research and Information), a not-for-profit policy research organization aiming to create a platform for youth in Bangladesh, in partnership with ‘Shikkha’ an educational research wing of Phoenix Bangladesh Foundation, arranged a ‘Career Talk’ titled ‘Making You Employable for the Global Market Needs’ on the 26th November, 2014 for the students and fresh graduates of Computer Science and Engineering and EEE particularly from BUET and different universities. The Career Talk was held at IEB Seminar Room from 10:00 am to 1:00 pm. Around 150 students were selected through a open pre-registration process. The programme focused on the key strategies, tactics and principles upon which students can build lasting career success. The program helped to produce meaningful, lasting skills to enhance participants’ professional effectiveness and thus will increase organization’s overall success. The distinguished speakers brought forth a crucial issue ‘employability Index’. The index illustrates that the unemployment problem is not a so crucial now as the market is growing. Rather it has become a problem to find out capable and skilled employees for the newly developing industries. Bangladesh German Chamber of Commerce & Industry along with its Gold Member SS Solutions- the sole agent and gold partner of SAP in Bangladesh, organized a business networking lunch on Tuesday, October 1, 2013 at a five star hotel in Dhaka. The event witnessed a huge presence of distinguished personnel of readymade garment sector. The seminar shed lights on how business can integrate and automate manufacturing, supply chain, sales, and financial process with an integrated solution specifically designed for the RMG at an affordable price with SAP. Ghulam Hussain, the Chairman of National Board of Revenue graced the event at the chief guest. 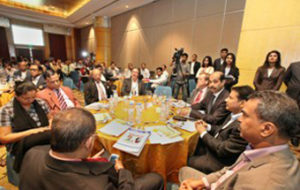 Dr. Albrecht Conze, German Ambassador in Bangladesh and Atiqul Islam, President of BGMEA were among the special guests. The speakers at the event shared their insights about the various challenges of the readymade garment sector in Bangladesh and how to overcome those challenges, and the importance of world class enterprise solution in this regard.